Denis Burdet and Stephan Siegrist (Switzerland), David Lama (Austria) and the American climber/photographer Robert Frost have made the second ascent of India's Cerro Kishtwar. This spectacular rock and ice peak of the Eastern Kishtwar Himalaya, in the troubled region of Kashmir, was named for its likeness to the famous Cerro Torre. It was the goal of Mick Fowler and Mike Morrison in 1989 but they got no further than the base of the mountain. The prominent rounded rock pillar in the centre of the North West Face was attempted capsule style in 1991 by Brendan Murphy and Andy Perkins. After 17 days these two finally reached the North Ridge, crossed onto the North East Flank, and were only 100m below the summit, when their food, which had already been rationed, ran out. Totally extended, and faced with what appeared to be hard climbing above, the two had no option but to retreat, having climbed 28 pitches up to Scottish 6 and A3. Fowler returned in 1993, this time with Stephen Sustad, the pair opting for a diagonal ice ramp left of the Murphy-Perkins line, which rose to a notch on the North Ridge. Having climbed this, they moved onto the North East Face and after a total of four days and passing the 1991 high point, they reached the top. The 1,300m route was graded ED+. Cerro Kishtwar has two summits. Fowler and Sustad arrived at the North West Top and then made the short connecting traverse to the higher South East Summit, which has map heights of either 6,200m or 6,220m. Since that year peaks of the Eastern Kishtwar have remained untouched, political difficulties in the Kishtwar region denying official access to foreign parties (though some have tried). This year these problems proved to be surmountable and Burdet, Frost, Lama and Siegrist planned a new line up the West and North West Faces. However, once on the mountain they discovered a "hidden" diagonal ice ramp curving up across the West Face to reach the upper South Ridge. The couloir gave out onto vertical rock. Above, the ridge proved easier and after four days on the mountain they reached the South East Summit, on which their GPS gave an altitude of 6,155m. The North West Summit, which they traversed to in 15 minutes, was five metres lower. The 1,200m route has been named Yoniverse and had difficulties of WI5 and 6a. A few days after this ascent Burdet and Siegrist left for an unclimbed peak south of Cerro Kishtwar, on the ridge leading towards Sentinel Peak (5,950m). Now well acclimatized, they were able to climb a narrow slanting gully on the West Face, reaching the summit the same day. 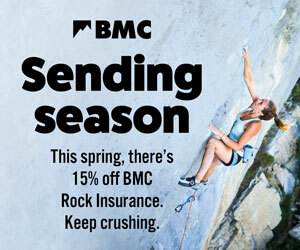 This gave climbing similar to Exocet on Patagonia's Cerro Standhart, with dry tooling, 90° ice and a difficult roof. Although shorter (850m), this was a far more demanding climb than Cerro Kishtwar, with difficulties rated at WI6, M6 and A2. The GPS gave an altitude of 6,040m on the North West Summit. The pair then traversed to the 5,980m South East Top before descending the South Ridge. They have named the route La Virée des Contemporains, and the peak White Sapphire. Discover the latest news and developments in the Indian Himalaya with volume four of Apex, the newsletter of the Indian Mountaineering Foundation. Nearly 30 years after their last climb together, BMC patron Mick Fowler and Vic Saunders achieved the first ascent of a stunning new 1,100m climb up the north face of Sersank (6,050m) in the Indian Himalaya. The Romanian couple Cosmin Andron and Cristina Pogacean have made the first ascent of the south summit of T16 in India's Zanskar Range by the 1,200m Supercouloir.